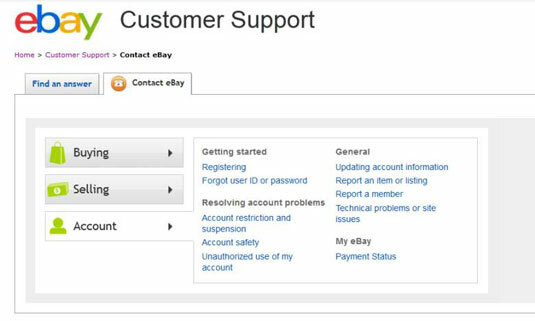 If you suspect someone of abusing eBay’s rules and regulations, click Customer Service in the main navigation bar. You are presented with self-service tools. From this page, you can search eBay for policy related to your issue. Selling: These links connect to Seller’s problems that may arise while dealing on the site. Clicking the appropriate topic allows you to open a case when necessary. Account: Any situation that might arise that involves your account, from forgetting your user ID to reporting another member will be available here. If you file a report, make your message clear and concise by including everything that happened, but don’t editorialize. (Calling someone a “lowdown mud-sucking cretin” doesn’t provide any useful info to anyone — and doesn’t reflect well on you, either.) Keep your comments businesslike — just the facts, ma’am. Be sure that the subject line of your report precisely names the violation and that you include all pertinent documentation. A copy of the facts you recorded on your report: And remember to stick to only the facts as you know them. E-mail correspondence: Although eBay can access e-mails sent through eBay Messages, you may have had correspondence outside of eBay from your personal e-mail account. Keep any pertinent e-mails with complete headers should eBay request them during their investigation. Trust & Safety uses the headers to verify how the e-mail was sent and to follow the trail back to the author. Receipts and cancelled checks: These help verify that a transaction took place, and when. Depending on the outcome of the probe, eBay may contact you with the results. If your problem becomes a legal matter, eBay may not let you know what’s going on. The only indication you may get that some action was taken is that the eBay member you reported is suspended, or turns out to be NARU (Not A Registered User). Unfortunately, NARU members can show up again on the eBay site. Typically, nefarious sorts such as these just use different names. This practice is common, so beware! If you suspect that someone who broke the rules once is back under another user ID, alert Trust & Safety. If you’re a seller, you can refuse to accept bids from that person. If the person persists, alert customer support by e-mail. Make sure that you don’t violate any eBay rules by sharing any member’s contact information as you share your story in a chat room. In addition, make sure that you don’t threaten or libel (that is, say untrue things or spread rumors about) the person in your posting. 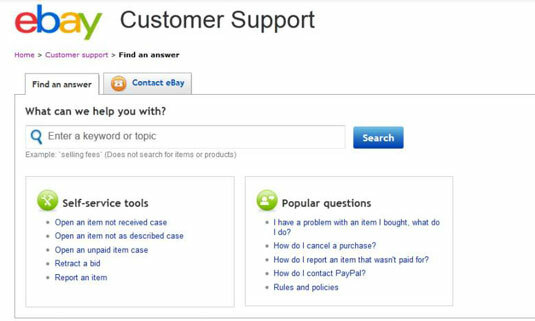 As eBay has grown, so has the number of complaints about slow response from customer support. Although slow response can get frustrating, avoid the temptation to initiate a reporting blitzkrieg by sending reports over and over until eBay can’t ignore you. This practice is inconsiderate at best and risky at worst, and it just slows down the process for everyone. If you need immediate help, the Contact eBay page often leads to a Call us link. This link assigns you a code number to identify you when you make the call to the number you’re given. You may get a link to send a report to an agent via a Report a Problem form. This form will vary, based on the issue you present. If you don’t think your issue requires speaking to a live human at that very minute, visit the eBay Answer Center (found under Community in the Navigation bar at the top of every page). This is an area where other eBay members answer your questions.